Facebook is reportedly testing out a “Memorable Stories” application that collects users’ status updates throughout the year to give you a text flashback of your own thoughts. According to select users who have seen the application popping up on their profiles, the feature shows up as a sidebar when you view a specific post. Instead of ordering the stories in chronological order like Facebook does now, users are given a seemingly random anthology of updates. You’re also able to eliminate entries you don’t want to read to see another. Facebook introduced its “Photo Memories” application recently, which was met with some criticism. After users complained about being shown photos of exes, Facebook decided to eliminate pictures between any other user you had previously been listed on the site as in a relationship with. It’s safe to say this new feature could introduce some similar regulation. 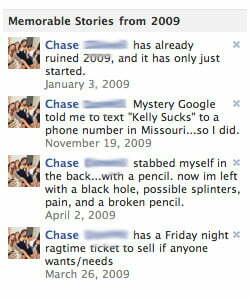 Those who have seen the application (including AllFacebook) on their pages found it went back as far as 2008. It’s been intermittently showing up on profiles, so keep your eyes open for it on your Facebook page.